Now that your team and coaches are registered we will continue with the process of submitting a meet sanction. To proceed, first you will need to go to your YMCA registration website. Next click Sign In, and login using your login email address and the password you created for your account. Once logged in, in the side menu click YMCA Admin > Meet Sanctions and you will be taken to a page that lists all existing Meet Sanction requests. For some teams this list will be empty. Once you submit a Meet Sanction Request, you will see those past requests listed on this page. 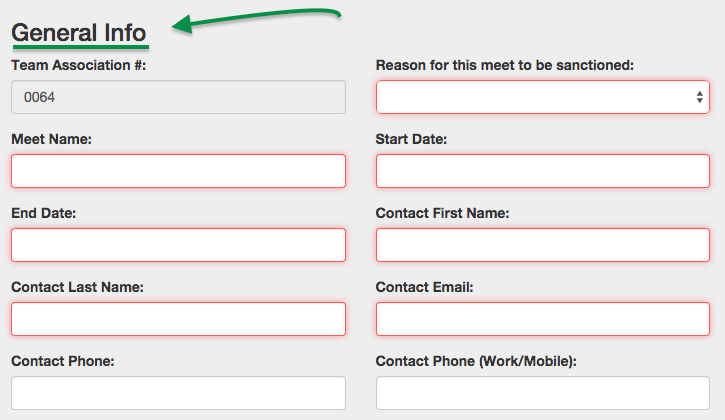 To create a new Meet Sanction Request simply click the + Request Sanction button. A form will load that will require you to enter all the required information about your meet including General Info, Requirements, Director Information, Referee Info, Facility Info, and Host YMCA Head Coach Info. Any field with a red outline is a required field. Prior to submitting your meet sanction, you also are required to upload a meet information packet. If you are unsure of the requirements of a Meet Packet, there is a helpful link to a document that provides the pertinent required details for a Meet Packet called the Sanction Meet Requirements. Once all information is completed and uploaded, click Save. When you have saved all of your Meet Sanction information, you are presented with a new button at the top of the page. If you are ready to submit your Meet Sanction request, click the Pay & Submit Meet Sanction Request button. This will open a form to pay for your Meet Sanction Request via credit card. Click Submit & Pay, then OK to confirm. Once clicked, your request will be sent to YMCA Competitive Swimming and Diving for approval, and further instructions, status changes, and updates will be sent to you via email. You are now done with the meet sanction request process. In the next lesson we will discuss some of the great YMCA Registration Portal features TeamUnify customers will get.